SS Peter and Paul Church is located in Union Dale, PA on Belmont Turnpike (Rt SR 4023) south, Mount Pleasant Township, Wayne County. The history of SS Peter and Paul Russian Orthodox Church actually begins with the founding of another church, The Nativity of the Virgin Mary, by four men: Afton and Samuel Bock, and Aleck (Wasil) and Ilko Tellep. Having immigrated from Austria, these men settled in Mayfield, PA. After working in the coal mines for a number of years, they took their savings and purchased land on top of a mountain three miles east of the village of Union Dale in Wayne County. Building their homes and clearing the land for farming was a great undertaking, but very quickly they felt within their hearts the spiritual need to build a church. They wanted to establish the Russian Orthodox Faith and to build a house of worship wherein they, together with their children, and their children’s children of the future, could worship Almighty God and express their love and gratitude to Him for the many blessings He bestowed upon them in this free and wonderful land. Having received the blessing of the late Archbishop Tikhon (canonized St Tikhon, Patriarch of Moscow and Enlightener of North America), for such an endeavor, Afton Bock donated approx. 5,695 square feet of land on which a church was to be erected, with the remaining land to be used for a cemetery. This contract was recorded in Deed Book No 93 in 1904. Trees were felled, logs were cut and taken to the sawmill. These men, with the help of John Wachna, a carpenter, and Steve Tellep, a mason from Mayfield, finally achieved their heart’s goal, the erection of Nativity of the Virgin Mary Church. The monks of St Tikhon’s Monastery in South Canaan took care of the spiritual needs of the new parish. The Bock and Tellep families took turns each weekend in affording transportation, room, and board for the priests from the monastery. Other families from the parish offered compensation to the priests for their services. Two such priests that serviced the church were Hieromonks Dionysie Pirko and Pachomy Deliman. As more and more settlers of the Russian Orthodox Faith moved into the area along the North and South Turnpike and in the surrounding area of the village of Pleasant Mount, the need arose for a larger and more centrally located church. After much discussion and indecision, Alex Kowalchuk offered 1 1/2 acres of land which is the present site of SS Peter and Paul Church and cemetery. It was decided to dismantle the Nativity of the Virgin Mary Church and use its lumber to build a rectory. In 1920, Hieromonk Joseph Novak began construction on the foundation. Two summers passed before it was completed. An “A” frome roog was then constructed over the basement, and for four years church services were held in the earth basement structure. In 1923 when Rev Theodore Migdal came to serve as pastor, the church was completely erected. Lumber was donated by the parishioners. 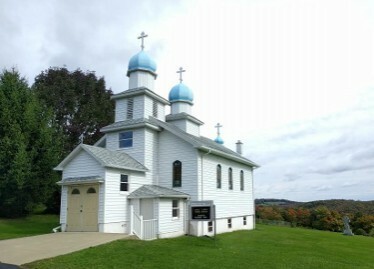 John Sawchuk and Matfey, carpenter friends of Fr Theodore, along with many of the parishioners, constructed SS Peter and Paul Church at a cost of eleven hundred dollars. In 1928, Rev Nicholas Gress was assigned as pastor of the church. It was during his pastorate that the interior of the church was completed. John Hutnyan, who assisted Fr Nicholas in building the iconostas, made the columns with an old hand-made lathe. Fr Nicholas was a talented iconographer and did the icons for the iconostas. Land was purchased from Alex Kowalchuk for fifty dollars on which a church hall was constructed by Gary Gaylord in 1931, and in 1947 the parish house was razed and a new one erected. Lumber for the house came from a dismantled house purchased in Browndale. Rev Hieromonk Tikhon Bushko from St Tikhon’s Monastery was assigned as pastor in 1955. During this time, the need for more effective central heating was apparent, and oil furnaces were purchased for the church and rectory. The exterior of the church also received asbestos siding. Upon the death of Fr Tikhon in 1960, Fr Alexander Poshyvajlo was assigned as pastor. Under the capable direction and contagious enthusiasm of Fr Alexander, an addition was made to the hall to include a kitchen, auditorium, refreshment room, and restrooms. The interior of the parish rectory was remodeled and the iconostas of the cchurch was renovated. Fr Alexander was reassigned in 1963, and for a year our parish was serviced by Fr Igumen Gennady. In the fall of 1964, Rev Joseph Swaiko (presently His Eminence, Archbishop Herman of Philadelphia and Eastern Pennsylvania) was assigned as pastor of SS Peter and Paul Church. During his pastorate, vestments, altar covers and vessels were bought for the altar, the sanctuary and center aisle of the church were carpeted, and a hurricane fence was erected enclosing the church property and cemetery. The church and rectory received new roofs, and the hall floor was refinished. A seven-foot granite cross donated by the Philip Dorosh family was placed on the cemetery. The rectory became rental property. In July of 1970, Fr Joseph organized and directed the celebration of the church’s Golden Jubilee. It was a glorious affair. His Eminence, the late Archbishop Kiprian of Philadelphia celebrated the Hierarchical Divine Liturgy. Following the service, a banquet was held at the Browndale Fire Hall, which was filled to capacity. A Fiftieth Anniversary Book was also published. Gramotas were awarded to John Hutnyan, Reader/Cantor, and to SS Peter and Paul Church. In December of 1970, Fr Joseph was tonsured a monk and received the monastic name Herman. In 1971 the interior of the church was paneled and the rectory remodeled. A six-foot stained glass window of the Resurrection donated by the Panko Hruby family was placed in the altar in 1972. The parishioners of SS Peter and Paul Church considered themselves most fortunate in having as their pastors several pastors from St Tikhon’s Monastery and Theological Seminary. We were privileged to share many benefits from these institutions that play such an important role in the life of the Orthodox Church in America. We were most grateful to the monks of St Tikhon’s Monastery who cared for our spiritual needs and to the many seminarians who offered their services where and when possible. In June of 1995, the parish celebrated its seventy-fifth anniversary. His Eminence, Archbishop Herman celebrated the Hierarchical Divine Liturgy, assisted by the pastor, Fr John Maxwell, previous pastors and local deanery clergy. A banquet was held at St Michael’s Hall in Jermyn PA.
As the years have progressed, the families who once had settled in this area, which has become known as the “Greek Settlement”, have since dispersed. The older ones have died and are alseep in the Lord, and the younger ones have moved away to pursue their livelihoods. And yet, Almighty God continues to bestow His blessings upon those few remaining parishioners and their endeavors. We, the parishioners of SS Peter and Paul Orthodox Church, having had a very humble beginning and knowing that even today we have not grown tremendously physically, we are grategul and give thanks to Almighty God that spiritually we are very rich. That seed that was planted by the early founders and fiven unto us more than seventy-five years ago, has been nourished and nurtured by us. We continue to glorify God and preserve His holy Church.